What do you do for a girlfriend who's going on a cruise or cross country road trip? You throw a party!! 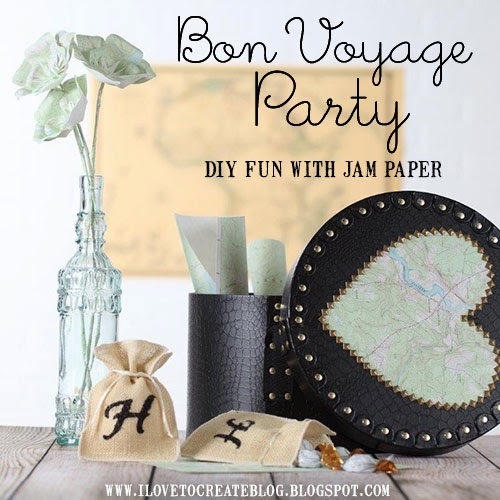 So we thought that a perfect way to do it was with a theme, and of course, the maps at Jam Paper were great to use in our 'bon voyage' decorations. The elements we decided we needed for the party were; flowers for the table, bags for the candy favors, and a special going away gift for her! 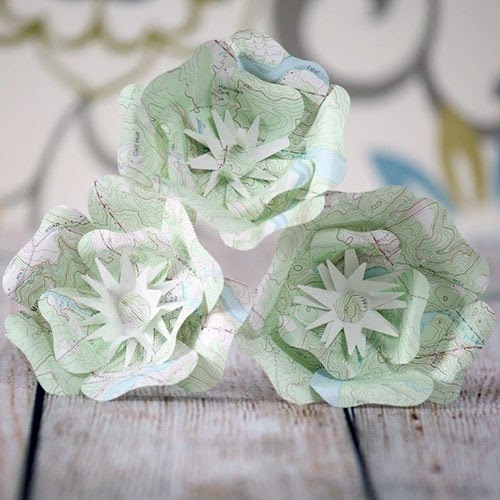 Today we're going to show you how to make the beautiful paper flower centerpieces, and we'll show you the favor bags and gift box tomorrow and Friday, so check back for those easy how-to's! 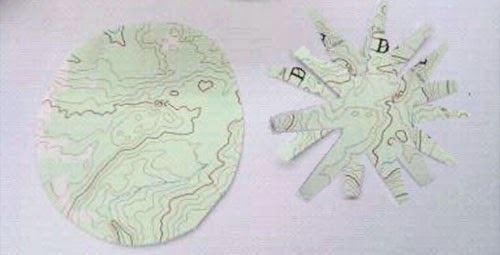 First trace petal shapes onto scratch paper and cut out with scissors. 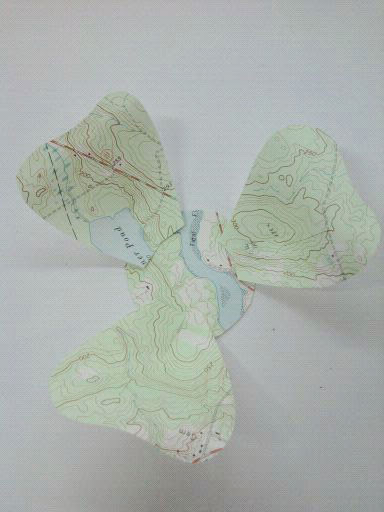 Next trace the shapes onto the map paper and cut out six large petals and three small petals. Cut a small vertical slit, approximately 1/2" tall, at bottom of each petal. This will become your pleat. Fold one side of slit over other side slightly, and secure with a Tacky Dot in between. This will curve your petal slightly. Repeat with remaining petal shapes. Now cut two circles approximately 1" wide for base of each flower and two star shapes for each flower. 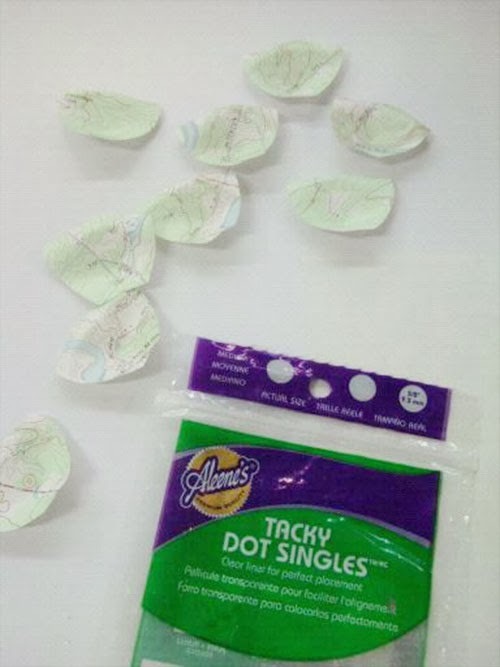 Use Tacky Dots so secure three large petals evenly spaced around edge of base, then fill in with remaining three large petals. Use Tacky Dots to secure three small petals evenly around center of larger flower. Now press together the star cutouts with a Tacky Glue Dot and bend star arms upward to form flower center (not pictured). Turn flower over and apply a Tacky Dot to center back. Cut a piece of floral wire to desired length of stem plus an extra inch. 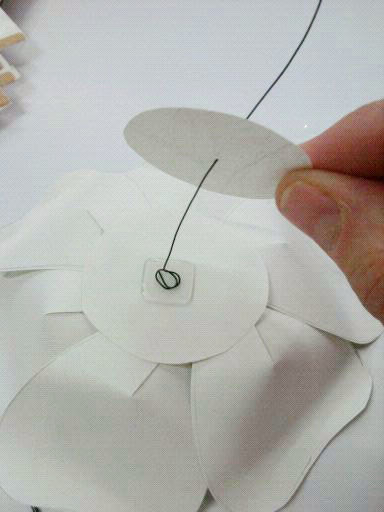 Bend the wire into a small spiral and press onto Tacky Dot on flower back. Take second circle cut for base and poke bottom of wire stem through center, drawing circle upward and pressing over wire spiral and applied Tacky Dot to cover. 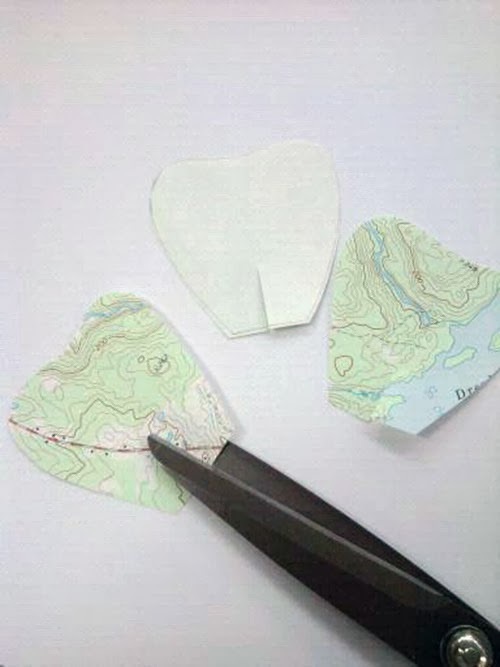 Cut several 1/4" wide strips of map paper. 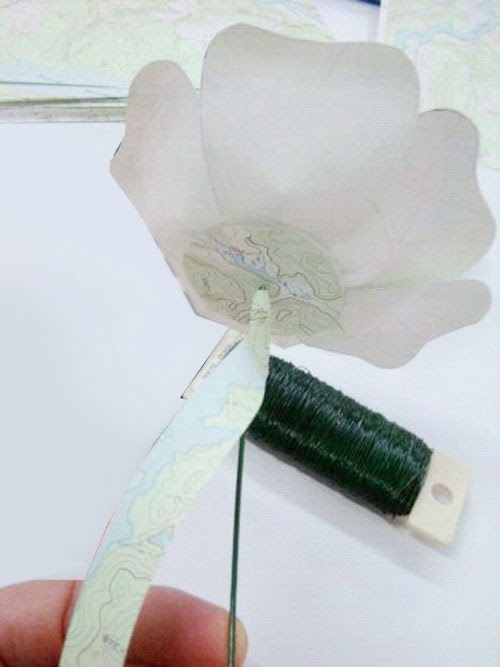 Attach first strip to stem wire under flower base with a Tacky Dot. 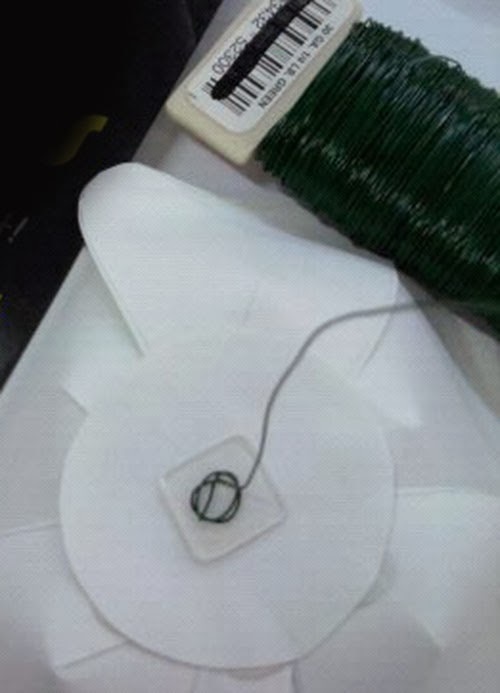 Wind paper around wire to cover, adding additional strips as needed. We made 3 flowers and put them in a clear vase. But, you could make lots more and place down the center of the table, or put single flowers in vases for each guest's place at a dinner table. Make it your own! 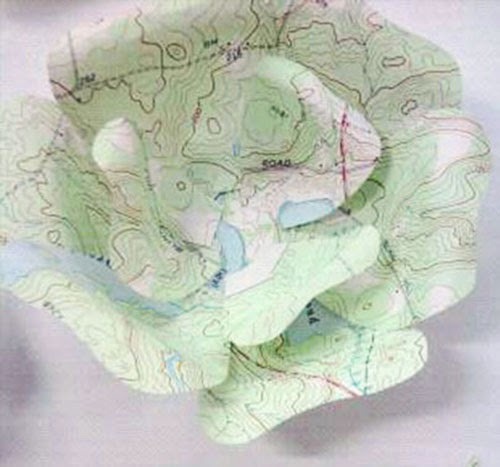 I made flowers very similar to this out of sheet music for a friend's recital one time. 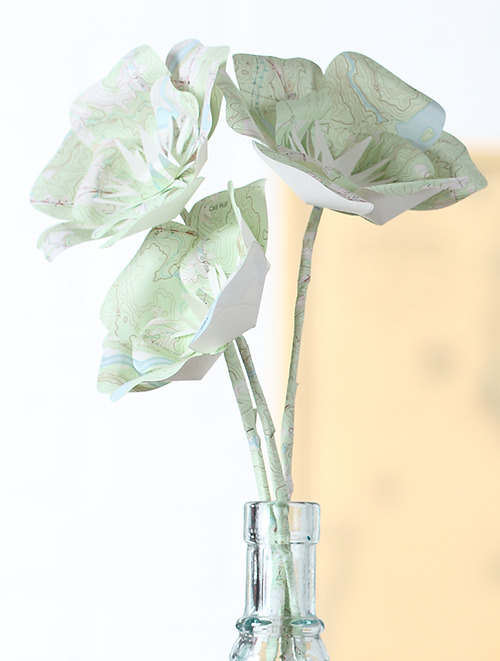 I love seeing them made out of maps. What a great idea!